Yay!!! It’s Friday! I’ve been waiting all week for this day! I mean, haven’t you? After our weekend in Denver, I headed straight for fashion week in NYC for all of a hot minute. I love fashion week and the idea of meeting other bloggers, PR companies, designers and influential people in the industry – it’s inspiring to surround yourself with such creative people! Unfortunately this season, I couldn’t find the time to go for longer than a day, but honestly, if you have been, one day is all you need 🙂 Stated tuned for my full post and recap – there is a great dress and embarrassing story in tow. 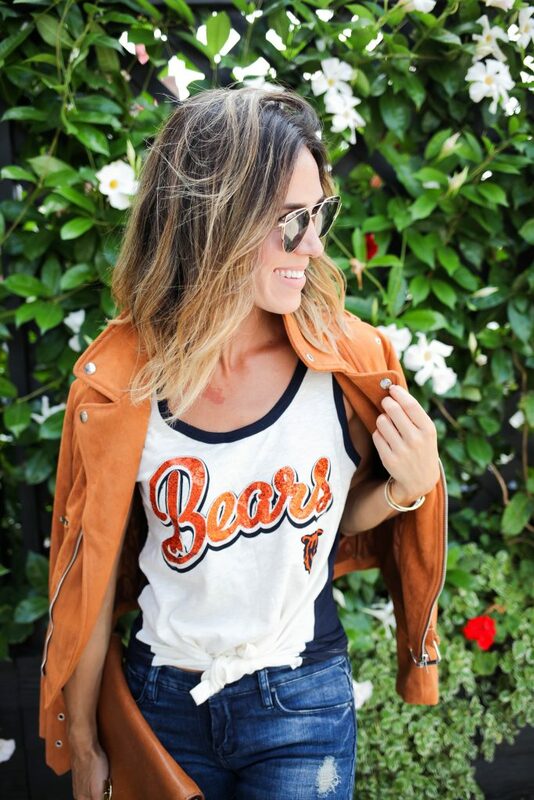 Today is all about this Chicago Bears Tank Top and how easy it is to pair with some of this falls hottest trends. Fridays are meant for kicking back, getting ready of the weekend and prepping your game day fashion. I’ll never turn down a moment to talk about game day fashion. Did you see last weeks post with this vintage sweater? How perfect is this sweater?? Well today’s look is all about incorporating your game day tee in to your every day wear. The common misconception about game day fashion is that it’s only for a game – EH! WRONG! There are so many other ways you can support your team and colors – or you don’t need to be a fan, you can just show off your best ahtleisure skills! There is something so chic about a vintage tee and a good pair of jeans. It’s fun to explore new ways to incorporate your game day tee and on this occasion I wore it to a Sunday brunch in the city. Since I have been craving all things fall in this crazy heat, all I’ve wanted to do is rock this shirt with my new favorite jeans that I scored during the Nordstrom anniversary sale. I may have been sweating, but I looked good. This was also a great reason to dust off this suede jacket (under $30) and these oxford platform shoes (under $40). Can we take a moment to reflect on the cost effectiveness of my accessories…….ok, lets commence. I bought these shoes back in the spring for my trip to Ireland – see how I style them here. What are you plans this weekend for game day? Need some fun recipe ideas? Check out some of my tailgate favorites here – I think I might have to the make the pumpkin spice bites this weekend! Yummy! wow, just found your blog! I think you are so cool. “sportsanista” I freaking love your title. And you are a chicagoan soon you have a special place in my heart now. Is that weird?… Sorry. Very obsessed! I simply want to mention I’m beginner to blogging and site-building and absolutely enjoyed your web site. Most likely I’m going to bookmark your site . You really have terrific articles. Thanks for sharing with us your web site.